This post is not the first in which I discuss my interest in children’s literature (like my love of YA fiction), and it will likely not be the last. My inspiration today is my current preoccupation: studying for my final exam in a Children’s Literature course (an Education course this time, cross-listed with English). The textbook shaping and informing this course is a lovely little volume called (you guessed it) The Pleasures of Children’s Literature by University of Winnipeg children’s lit scholars Perry Nodelman and Mavis Reimer. As a textbook, Pleasures is fairly rigorous and methodical. Its voice is also just casual enough that it makes for enjoyable (and informative) reading. As far as required texts go, I’ve been subjected to much drier. That’s not to say the text is perfect–the authors supply a lot of theories about engaging children with literature, and plenty of their own (albeit educated) opinion and bias, but leave practical application of these theories more or less up to the reader. They also unforgivably dismiss one of my favourite trilogies, Philip Pullman’s His Dark Materials, as little more than a variation on the simple “home-away-home” theme (which completely misses the point of the novels and is also just plain wrong wrong WRONG!). These criticisms aside, my journey with this text has been a good one, and, considering the ways in which literature for children is inextricably linked to education, I’m happy to report it’s taught me things too. Ask anyone–a parent, a teacher, a young bookworm like me–what makes for appropriate literature for kids, and you’ll get similar kinds of answers which usually include the following: It should be simple. It should be colourful. There should be lots of action. It shouldn’t be too scary. It should end happily. It must not have too much violence or contain anything sexual. It must not demonstrate or describe behaviours or beliefs we do not want children to copy. It must have characters children will relate to–boys want to read about boys, girls want to read about girls, etc. of a similar age to themselves, with cultures and values like their own. These assumptions about what makes a good book for children leads us to question what we are assuming about children themselves. Based on the assumptions above, we are really assuming that children have short attention spans and lack the ability for sophisticated thought (hence the need for simplicity, colour, and constant action). We assume that children are naturally innocent (hence books can’t be “too scary”, can’t acknowledge violence or sexuality, and must end happily). We also, paradoxically, assume that children are naturally bad and will immediately copy any wicked behaviour they are exposed to in literature without proper guidance (hence the need for censorship). Another paradox is that we assume children are self-centered (which is why they only like to read about characters like themselves), but, as described above, they are somehow also very easily influenced by whatever they read. As far as children’s lack of sophistication goes, it turns out that much of what we believe to be “obvious” about children’s mental development (and by extension, what they are capable of reading) actually stems from the research of the Swiss psychologist Jean Piaget. It’s worth noting that the methods used in the experiments Piaget conducted to “prove” his theories of mental development in children would likely not pass muster in the field of psychology today and serious objections have been raised regarding both his methods and his logic. It is Nodelman and Reimer’s position that because we still (perhaps falsely) believe that children’s understanding is limited, we limit the literature and learning materials they are exposed to, and therefore create their limitations ourselves. Thing Number Two: Some of our most beloved and enduring children’s books, the ones we believe to most truly capture the essence of childhood, are really only capturing what we, as adults, want to feel that childhood is or was. The two most obvious examples of this that come to mind (out of the many many books the authors of Pleasures discuss in their text) are A. 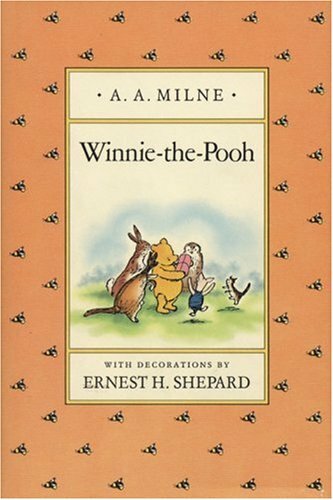 A. Milne’s Winnie the Pooh books and J.M. Barrie’s Peter Pan and Wendy (usually known nowadays as just Peter Pan). Both of these stories revolve around the innocent and fantastical adventures of childhood, and both end with the title character being left behind by a dear friend who must “grow up” (oh god, I’m getting teary just thinking about it). Though many many children do love the stories of Pooh and Peter (for me, it was the flying), I agree with Nodelman and Reimer that the real audience of both of these stories, i.e. the audience that can best understand and appreciate them, is an adult one. It is because we no longer possess the ignorance and innocence of Pooh and his friends that we can find humour in their sayings and doings (our relative experience also allows us to better appreciate the eternally pessimistic Eeyore, a character I found boring as a child). It is also because we are no longer young ourselves that we find an island like the Neverland (where you never never grow old) so beguiling. If you think about it, is childhood really as golden and idyllic as A. A. Milne and J. M. Barrie describe it as being? Not really. For the lucky children (like me), it’s very fun and magical but it’s also very messy and confusing and scary and uncomfortable. For unlucky children (which, on a global scale, is most children), there is abuse and/or neglect and/or illness and/or war and/or poverty. Not exactly a romp in the Hundred Acre Wood or a flit off to the Neverland. And although adults know these things, in Western culture we still like to see representations of childhood that are eternally bright and heart-breakingly carefree. They provide entertainment to children, yes, but more importantly, they provide comfort and nostalgia to adults. Thing Number Three: The creation and availability of children’s literature is driven by adults, in service of adult concerns, and not by children. This should be obvious, since adults are the ones writing, publishing, selling, selecting, and buying books for children, but we sometimes seem to forget this. The books you can find in the children’s section of a bookstore are the winners of a very profit-driven lottery, and the odds are becoming more difficult each year. In a nutshell, publishers are printing less titles, but expect to make just as much money (or more) from less. This means the titles publishers do print must (regardless of literary merit) be blockbuster money-makers, like the Harry Potter or Twilight series; they are much less likely to take a chance on a more obscure but perhaps better book that may become a classic over time. Depressing. Because teachers and librarians (the primary buyers of kids’ books apart from parents) are increasingly worried about the threat of censorship (often by parents who haven’t even read the entirety of the book they are trying to ban), they are increasingly unlikely to buy books that may be censored, and publishers are increasingly unlikely to print them. Also depressing. Ho hum. Thing Number Four: Many of the most widely used strategies for teaching literature to children aren’t creating what Nodelman and Reimer call “ardent readers”, primarily because these strategies ask children to do things that ardent readers don’t do. This point is really hit home with me, especially since I consider my own “ardent readership” an important factor in the course of my education and life. If I had not already lived in a house of books and been introduced to the activity of reading by my parents and older sister, I would likely have been utterly turned off reading by the stupidity and uselessness of the “activities” my English classes forced upon me. According to Pleasures (and my own experience), ardent readers get caught up in the book they’re reading. They engage with the suspense, they rush to the end to find out what happens. They do not stop every time they find a word they don’t know to look it up in the dictionary. They do not ask themselves absolutely vapid comprehension questions that have more to do with unimportant details than with the point of the book itself. They do not waste time making posters of scenes from the book (unless they like to draw, or if it’s a tie-in with art class, but I will never forgive those well intentioned teachers who gave me marks off in ENGLISH class for the quality of my COLOURING). Ardent readers talk about the books they’ve read. They argue about them, they defend their position. They think about what the book means to them, not blindly accept what their teacher says it means so they can parrot it back in a test. And they acknowledge, if they see them, the innuendos, ironies, and possibilities for “reading against a text”, even if that interpretation isn’t a sanctioned part of the school curriculum. I always got the feeling that my teachers expected their students to dislike reading, so they tried to assign activities loosely based around a text but that required as little true reading as possible. Nodelman and Reimer also note that many (too many) teachers who “cover” poetry in their classrooms neither understand nor enjoy poetry themselves. You can’t really blame kids for not understanding/enjoying it either…sigh…. (all I can hope is that today’s teachers of English or Language Arts are reading Nodelman and Reimer too…). Anyways, while occasionally bleak, I liked this textbook. With teachers for parents (and my desire to someday be a parent myself), I’ve always been interested in the field of education. Being a lover of English literature and possessing a certain whimsical streak, I’ve always been interested in the field of children’s literature. 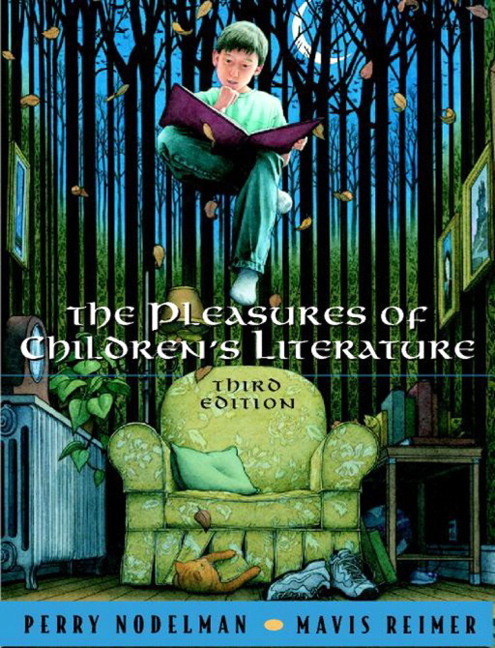 The Pleasures of Children’s Literature was a great introductory read. The greed of the children’s culture industry and the various failings of our education systems notwithstanding, my love of the genre is intact and my old favourites (whether actually read in childhood or acquired after the fact) are still friends to me. Thanks Gina! I heartily recommend perusing the book (or at least the chapters that interest you). I am currently reading this book in my EDUC 465 Children’s Literature class at Simon Fraser University. I loved this article Lauren! You did great job of summarizing chapter 5 to fit my style of reading. I agree with you that, Nodelman and Reimer, write in a fairly casual and easy to understand voice however I did end up getting lost during a few chapters. Your article cleared some points up for me. Thanks so much! Thanks! Good luck in your course! Though I’ll never forgive Nodelman & Reimer for dismissing the “His Dark Materials” series the way they did, it was otherwise a pretty great and enlightening text.